Anyone familiar with underrated German Heavy Metal band Warlock will know instantly that their front woman, Doro Pesch, had one of the most fabulous voices in Metal history. Whereas female singers within the Metal world are now commonplace, with female-fronted groups like Lacuna Coil, Arch Enemy and Nightwish all constantly increasing in popularity, the 80s was decidedly more discriminating towards ladies being anything other than stereotypical groupies. Yet Doro’s beautiful voice and passionate lyrics fought against this old-fashioned standpoint and she is remembered by many as someone who revolutionised Metal music to pave the way for women’s involvement. After Warlock’s somewhat unpleasant split in the late 80s, Doro continued with a successful solo career under her own name, continuing to release albums of epic Heavy Metal anthems stamped with her unmistakable vocals. With 2004’s “Classic Diamonds”, she revisited a selection of Warlock classics as well as some of her solo material and collaborated with The Classic Night Orchestra for the re-recordings. The results are simply staggering from the outset, with the utilisation of a full orchestra set-up and acoustic instruments fully complementing the beautiful vocals whilst still maintaining the power of the older and heavier tracks. Classics like “I Rule The Ruins”, “Metal Tango” and “All We Are” sound even more impressive and captivating than the original versions mainly thanks to the strings and brass so prevalent within the overall mix as well as some striking classical guitar parts. “All We Are” in particular retains its extremely enjoyable anthem style with some excellent vocal efforts. Furthermore, the cover of Judas Priest’s archetypal “Breaking The Law” benefits completely from this orchestral reworking, sounding just as desperate and intense as it did when it was first released in 1980. The only weakness here is the inclusion of over the hill Accept vocalist Udo Dirkschneider as a guest vocal partner, somewhat tarnishing an otherwise perfect performance. As well as these powerful remakes of classic Metal songs, the album also consists of some more Pop-orientated tracks, such as “Für Immer”, “Let Love Rain On Me” and “Love Me In Black”. They do sound rather more formulaic in their execution and wouldn’t seem out of place being performed on mainstream Pop shows but again the vocal performance on each of the songs saves them from being overly generic and does make for some pleasant easy listening for head bangers in need of relaxing their necks. 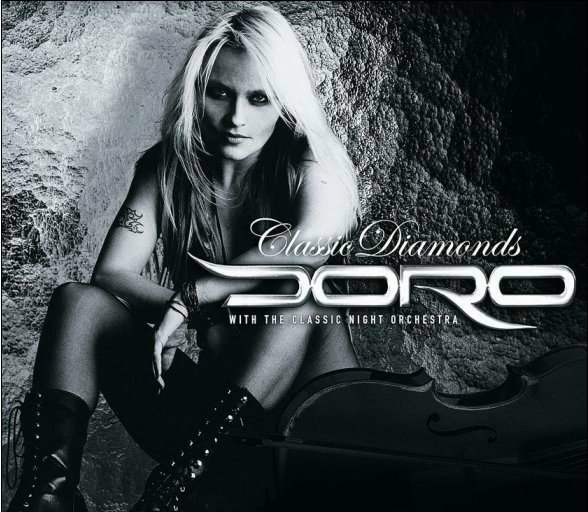 Whilst some of the material on “Classic Diamonds” might not appeal to the average Heavy Metal fan, it is definitely worth a listen if only to hear perhaps the best recordings to date of the vocal talents of Doro Pesch. The original Warlock material certainly had more of a hard edge to it but these adaptations still manage to do them justice, with excellent musicianship and a great production shining through overall. For anyone who hasn’t heard anything by Warlock or Doro, “Classic Diamonds” works perfectly as an accessible introductory piece. It takes balls to strip your songs down to the bare bones, and then put a classical spin to them. The unplugged thing is so 90’s, done to death; the classical thing could go over very well or turn out disastrous. Metallica worked well, Scorpions and KISS tanked, all three legends in the hard and heavy world. Doro, known for her years fronting Warlock and for her work as a successful solo artist, takes a chance on Classic Diamonds and incorporates classical music with metal. What sets apart this release from the other hard rock/metal meets classical records? These songs from the Doro catalog have truly been reworked; they are very different from their originals. I was surprised by the fact that there is no distorted guitar on here, in fact it sounds like they are all acoustic, clean guitars, the bass is also acoustic, there are drums however and they take the heaviest role in this recording. In a sense Classic Diamonds is a reworked hits collection there are a total of 13 tracks three which are newly recorded for this collection they are “Let Love Rain on Me,” “I’m in Love with You,” “She’s Like Thunder,” this was written for friend Regina Halmich, who is a champion boxer closes this collection and a mind blowing cover of Judas Priest’s “Breaking the Law,” which starts as like a Joan Baez number then generates steam and features guest vocals by Udo Dirkschneider. The cover takes some time to grow on you, it’s very different from the original, but that the trend on this record. The other track on here you’ll know, either because you’re a fan or because you have heard them before. This is a must for any Doro enthusiast’s collection and a good starting point for those folks that aren’t familiar with her work. So far, this is the only record of it’s kind that demands a follow up.